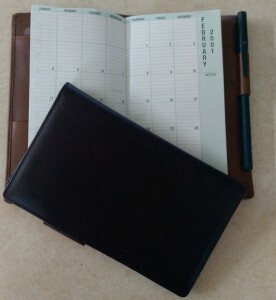 Before we kept our appointment calendars on our phones and computers, my husband and I had Day-Timer daily planners with calendars made of that antiquated substance, paper. Even after we stopped buying the calendars, we didn’t throw away the pretty leather covers because we liked them so well. So they just sat in our study for years, at the back of a shelf, until I found them last week. The one with brown leather, open to February 2001, was my husband’s planner. The burgundy was mine. After taking this photo for my post, I was going to throw them away, but still hadn’t quite convinced myself to do the deed. After all, some people still have daily planners with paper calendars—they’re not totally obsolete. And maybe there was some other possible use for them. I had to give myself a stern lecture on not rationalizing my clutter before I could bring myself to dispose of them. Technology has been advancing so quickly that sometimes we just have to get rid of old stuff, even though it is not worn out, because it lacks the usefulness it once had. A GREAT idea, M. Clutter is exactly what I am trying to tackle today. Have fun. Thanks — and if you find anything comical that you decide to blog about, please feel free to post a link here! I actually still use my Filofax, in conjunction with digital methods. I have never gotten over the need of putting pen to paper to keep my schedule. I found my way to your blog after you paid a visit to mine, and I owe you a debt of gratitude! You’ve inspired me to start my own Random Kindness Blog Tour journey, and yours is my first stop. So, thank you! Awesome! Thanks so much for participating, for letting me know about it, and for the kind mention on your blog! As for needing to put pen to paper, I sometimes feel like that too. Usually I compose first drafts of my longer blog posts and stories by hand, as I find that using pen and paper is a more peaceful experience and helps me to get my thoughts better organized.